Currently I’m… infusing the air with my new Young Living Essential Oil. This time it’s one called EndoFlex which helps regulate the ol’ hormones! I have a feeling there will be a lot of essential oil talk in the future. Stay tuned. 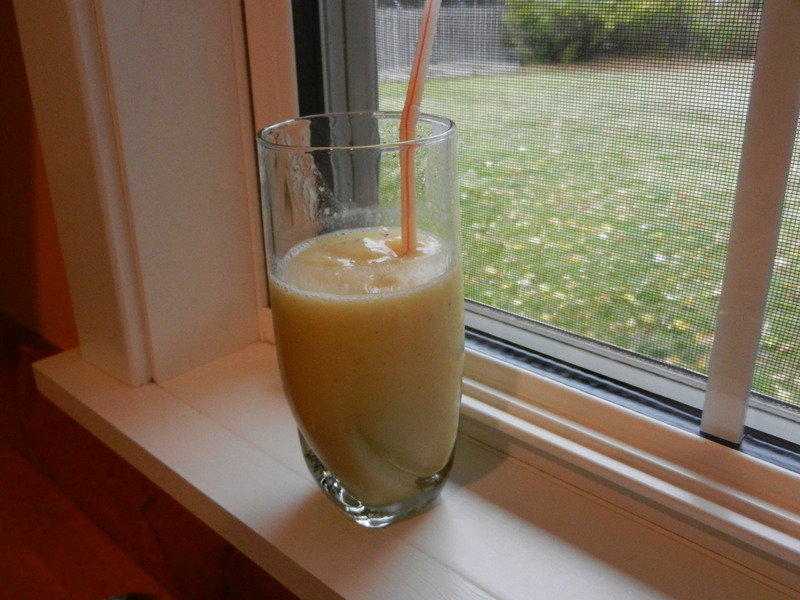 Currently I’m…sipping on the world’s ugliest smoothie which also happens to be one of my favorite smoothies. Kale, frozen banana, raw cacao powder, peanut butter. Currently I’m… looking for a new book to read. I just finished a book I borrowed from my chiropractor called Golden Rules for Vibrant Health in Body, Mind, and Spirit, A Holistic Approach to Health and Wellness by Joseph J. Sweere. It is a great book which reminds you to think about the foods and drinks that go into your body, how your environment can affect your health, handling stressors, etc. Currently I’m…dreaming of an exciting trip coming up this month! Destination is yet to be announced! Currently I’m...trying to stay warm. I’m in my warmest robe and have the heat cranked. Currently I’m…very thankful that we have a treadmill in our basement. I have been using that thing like it’s my job! Plus, it helps having the iPad right along with me. I am on the final season of Gossip Girl and the suspense keeps me running and walking for miles! Check out this article about the “Netflix Fitness Effect”: Binge Watching I’m completely guilty. I don’t know if it’s a good or a bad thing. I guess I just don’t like the word ‘binge’ because it is usually associated with a negative behavior. Currently I’m…excited about the loads of good food in my fridge. Zucchini, coconut milk, cottage cheese, cheese, organic carrots, grapes, leftover guacamole, leftover sliders, raw vegan brownie bites. So many delicious options around this place. Thoughts on holistic wellness and complementary wellness? Good shows on Netflix for me to watch after Gossip Girl? It’s Thursday already! How about that? We are almost to the weekend again. 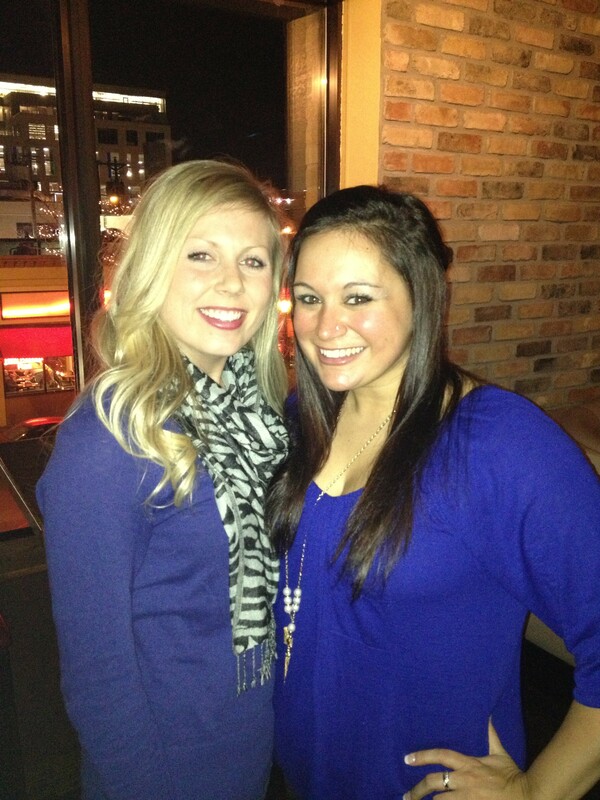 I love having New Years in the middle of the week! I haven’t been doing a fantastic job of snapping photos of my delicious eats, but I do have a few to share with you that have just been hanging around and deserve mentioning. I missed the official WIAW yesterday but I’m still going to roll with it and make this a some of what I’ve been eating lately post. This Mediterranean inspired salad: fresh spinach, roasted zucchini, asparagus, mushrooms, and onions, hummus, olives, feta, and yellow quinoa. I was originally planning on putting this all into a wrap but changed my mind last-minute; go figure. I really enjoyed this salad. Dana had his as a wrap and liked it a lot too. I made a ton of the roasted veggies so we have been eating this as leftovers for days. There have been a lot of smoothies. I go back and forth about whether or not I appreciate a cold smoothie on a cold winter’s day, but lately I have been absolutely okay with it. My latest mix might sound strange but I am really into it: frozen bananas, frozen kale, frozen blueberries, kefir, almond milk, ground flaxseed, maca powder, raw cacao powder, peanut butter, and one date. It has a smoky chocolately slightly sweet taste and I feel like I’m eating a shake for breakfast. I never said it was pretty though! For New Year’s Eve we went over to a friend’s house for dinner. They made us Cuban calzones and parmesan spicy sweet potato fries. OMG. Everything was absolutely amazing. This inspires me to have Cuban wraps or sandwiches more often! I love the combination of textures and tastes from the smoky saltiness of the shredded pork and ham, crunchy pickle, melty cheese, and tangy mustard. K, I want to go make a Cuban right now. My compliments to the chef!! My snacks lately have been: popcorn, nuts, raisins, fresh fruit and veggies, and raw brownie bites! Have you made the brownie bites yet? If not, please do so! I’ve been increasing my tea (decaf) intake to help to cleanse my body of the Christmas sugar load. Plus, I’m giving my colon a break from coffee for a bit. Lately my favorite is Wild Harvest’s Green Chai Tea! Last night I made lemon pepper shrimp and roasted acorn squash but was incredibly disappointed when I bit into the squash. It just didn’t taste right. No wonder they were on sale I guess. I pitched the squash and made myself an array of random food: peas, crackers and cheese, some raisins, peanut butter…it turned out alright. I’ve definitely been cleaning up my act when it comes to clean and healthy food choices (for the most part). Besides eating well, I have been staying active and ACTUALLY getting to the gym and not just doing cardio; I’m actually strength training again! Wooo! I am staying hydrated by drinking plenty of water and organic green tea. My body is thanking me and patting me on the back. So far so good with keeping to my New Year’s casual resolution although I’m not sure what we are having for dinner tonight. I’ll get on that. Did you make a New Year’s Resolution? Wish to share? Has anyone else experienced bad squash lately? What are you snacking on these days? First and foremost, happy Friday to you all! We have two very special guests staying with us this weekend so I am one happy gal. I’m keeping it short and simple for you all this Friday. I have been really loving my smoothies lately especially now that I have reintroduced bananas back into my diet. I have been mixing up lots of different concoctions but have found one that has become my go-to smoothie. I never really measure out the ingredients, I prefer to “eyeball” them, but I did my best to estimate the correct measurements per ingredient so you can try making it at home yourself! Give it a good whirl in your blender or Nutribullet until completely blended. Enjoy as an on-the-go breakfast or a perfectly healthy afternoon snack! Warning: Be careful drinking this smoothie when wearing white clothes! I usually play it safe by wearing an apron in the car if I’m taking it on the go. Nerd alert. Question: What’s in your go-to smoothie? After completing my Insanity workout yesterday I replenished myself with a big cold smoothie. Whew! That’s a lot of nutrients jam-packed into one smoothie. I literally couldn’t keep my hands out of the fridge yesterday; my appetite was insane! I couldn’t even tell you everything I snacked on in between breakfast and lunch. By the time “lunch” actually rolled around I made myself a piece of toasted almond bread with peanut butter and a drizzle of honey. And more snacks happened after that. The crock pot came out last night. I wanted to use up a head of red cabbage I had in the fridge so I decided to make a crock pot version of my cabbage roll casserole. I used most of the same ingredients this time as I did before, but I also added zucchini and mushrooms this time around. I added everything into the crock pot except for the mushrooms, gave it a stir, set it on low and let it go. I added the mushrooms in at the last 45 minutes of cook time. This was a very nice way to spend my Thursday evening; eating a warm bowl of veggies and relaxing in my warm home. Does anyone else think cabbage is a bit underrated? I understand the effects it can have on the digestive process but other than that, it’s some good stuff! I feel like cabbage is fairly underrated. Do you have any good cabbage recipes? I really love Oriental Cabbage Salad with Ramen Noodles. Whenever it is at a get-together, I have to snag a bite! There’s nothing like starting your day off with a veggie and fruit packed smoothie. Yesterday I whipped together a smoothie made with frozen banana, kale, kefir, aloe vera juice, peanut butter, and chocolate egg white protein powder and it was delicious. I hit the living room for an arm workout, and then ended with a 30 minute incline walk on the treadmill. I’m slowly but surely getting back into more of a routine with the workouts again. Then I was off to run a few errands and spend some quality girl time with my Betsy. We both had the day off of work and we haven’t hung out since our lobster feast a month ago which is WAY too long if you ask me, so we planned a little get together. We were cozy and warm at my aunt and uncle’s house and we chatted away as Despicable Me played on the TV in the background. It was such a relaxing afternoon and I loved every second of it. In the afternoon Dana and I did some shopping—we are looking for new countertops for our kitchen! Once dinner time rolled around, I was not in any mood to do any cooking and it just so happened that we had a gift card for Baja Sol that we needed to use. You may remember a couple of months ago when we tried to use this gift card but ended up going out for Thai food instead. Yup, it’s that same card, but we actually used it this time! We went to the Baja Sol located in the food court at Mall of America. We made it up to the third floor and started walking towards the food court. Inevitably we parked on the opposite side of where we needed to be, but I was happy because it felt good to move my legs. Anyway, as we approached the rotunda we started hearing some music playing. When we got close I saw the sign (…and it opened up my eyes…), I got SUPER excited. Gloriana was playing at MOA! Maurices was sponsoring their performance. How cool, right? We didn’t stick around for long because there were so many people and I really couldn’t see them too well, but I was happy to even get the one glimpse that I did. At Baja Sol I ordered the veggie fajita salad. This monster was piled high with lettuce, sautéed onions and bell peppers, tomatoes, fresh onions, cheese, black beans, and a heaping spoonful of guacamole (I shared some of the gauc with Dana because I am a very sweet wife). I didn’t touch the shell because I’m still trying to stick to gluten-free and it was a flour tortilla, but I managed to chow down a good majority of the salad! It tasted really good and probably even more so since I didn’t have to put it together myself. 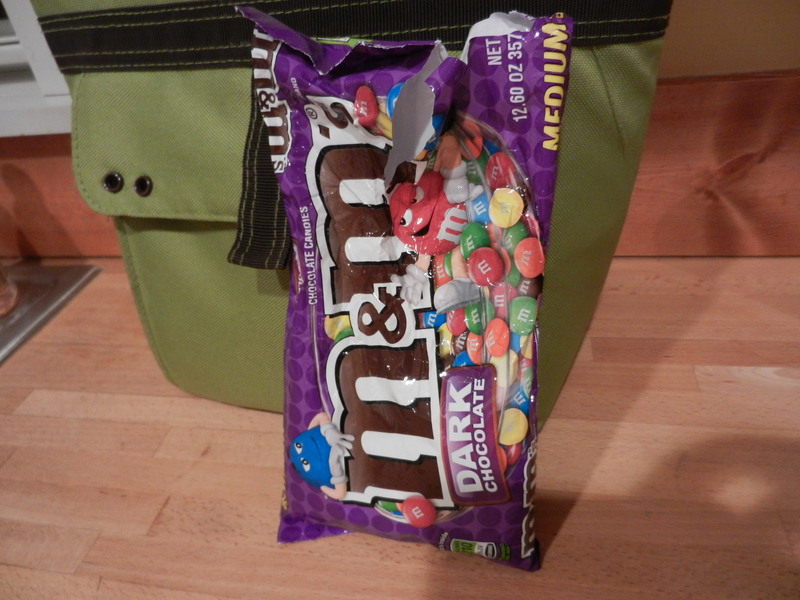 It was a perfect Friday night treat. Now I am off to run with Dana and the pooch around the neighborhood before heading out for a day full of friends and family. It should be a good one! Catch up with you all later gators. Haaaapy Hump Day! I hope everyone is having a good week and staying cozy and warm if at all possible. It was the perfect way to warm me up on what was such a cold morning. Sweat PINK! For lunch I made a smoothie with Jay Robb chocolate egg white protein powder, banana, almond milk, kale, and peanut butter. I always think of Shannon when I make this one because she was the one who recommended it. Yummy in my tummy. I packed some snacks for the afternoon for work: sugar snap peas, carrots, and an apple. For dinner I made tilapia with a light breading made of almond flour, italian seasoning, a little salt and pepper, and garlic powder. I first dipped the filet into egg whites, then into the flour drudge, and then onto the pan to lightly fry. Our side dish was a cucumber salad with tomatoes, red onion, red wine vinegar, salt, pepper, dried dill, and a sprinkle of onion powder. For my “appetizer” I snacked on hummus and broccoli. We don’t mess around with our veggies in this house. Check out the Costco size bag of broccoli on the right. What we usually end up doing is eating about 3/4 of it raw, and then freezing the last 1/4 of it before it goes bad. Oh how I miss my natural light in the evenings for photos. Soon enough! Throughout the rest of the evening I continued a snacking brigade: pistachios, a glass of wine, dates…then it was off to bed I went. Is anyone else guilty of glancing into other grocery shopper’s carts while shopping? I am totally 100% guilty. It may be because I am a dietitian, and have a passion for health and nutritious food, or I may just be nosey? I am just in amazement as I see what some people load into their carts. Just the other day I saw in one cart: multiple breakfast pastries, the most sugary cereal you can think of, chips, soda, pizza. I was flabbergasted and all I wanted to do was go replace each and every one of those items with a healthy option. But, to each their own. Of course there was no way I would do that. Everyone has a right to eat what they please. It just tugs at my heart strings a little. After our weekly grocery trip on Sunday, I decided it might be fun for you all to get a peek into my cart and furthermore, into my refrigerator and cabinets. I am not touting that everything in my household is healthy, but I remind you that it is all about finding the perfect balance of healthy eats and treats. Sweet and Nutty Bites recipe here! There you have it. Have a warm and fuzzy day friends! xoxo. What are some staples that YOU always have on hand? Last night was one of those nights where I was exhausted around 7:30 pm, struggling to keep my eyes open yet made myself stay awake so that I would be able to go to bed at a decent hour. At 9:45 pm, I crawled into bed, tired, read my book for 25 minutes, still tired, turned off the light but couldn’t turn off my brain. I don’t know what the deal was last night but I was thinking of everything under the sun and could not put my mind to rest. Usually I can read my book for 20 minutes and then be out, but last night was a casualty. The book I’m reading is about healing your body through meditation. I like a lot of it, but I don’t like the idea of having to sit and do nothing accept focus on myself for 45 minutes. They do mention that meditation time can be done during yoga, which makes sense. I like that idea better. The book talks a lot about focusing on your breathing, not only when you’re in mediation, but throughout the day. It is a reminder to live in the moment and grab a hold of yourself when daily activities become too chaotic. Why am I talking about this book so much? To put it into context, I tried focusing on my breathing last night to get me to fall asleep, and I think that may have been what helped me. I’m not quite sure, though. But all in all I didn’t get enough sleep for my personal sleep needs last night. I am one of those people who needs a solid 8+ hours for highest functioning ability, and last night I probably only got 6. However looking on the bright side, I am fortunate to have a warm and comfortable bed to sleep in, a roof over my head, and clean water to have at the bedside. I will try and focus on the positives to get through the day! Anyone care for a Piña Colada for breakfast? Virgin of course. I did my best to measure it out yesterday when I made it in the morning (the above photo was from my first trial a couple of days ago, it’s actually more voluminous than that), so that I could share it with you all. Whirl all ingredients together in blender until smooth, pour into glass, serve with a straw. I have been whipping this smoothie up before work and enjoying it on the drive. A fraternal twinsie from Tuesday’s salad. 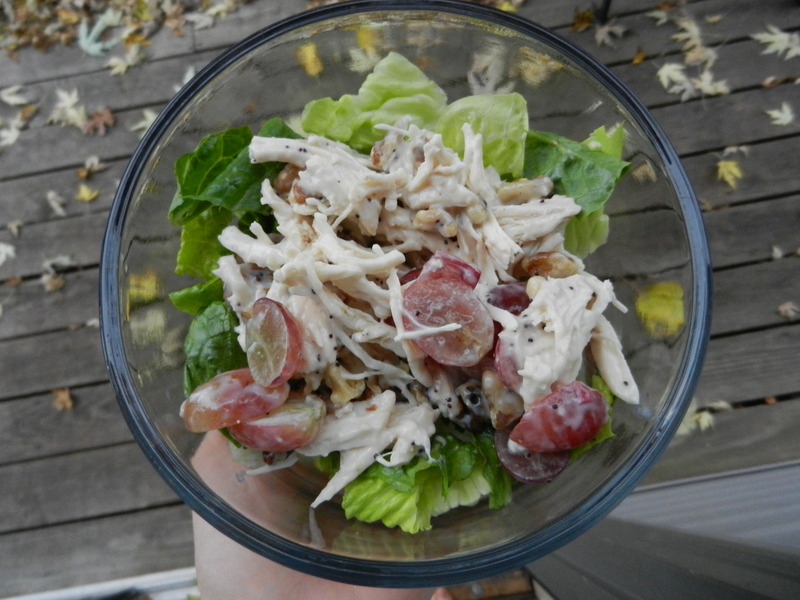 This one was chicken, grapes, and walnuts mixed with Ken’s Lite Poppy Seed dressing ,served on top a bed of romaine lettuce. The only thing missing this time around was feta cheese. I just wasn’t feeling it and was going for more of a “chicken salad” this time around. Work was very busy and I came home exhausted. We had intentions of running errands after work but I put a big ol’ red x on that idea. I knew I should be hungry for dinner but nothing was sounding too appetizing. I also knew I needed to increase my veggie intake for the day (mind you I did have some carrots with my lunch that I didn’t mention), so I threw a hodge-podge salad together. 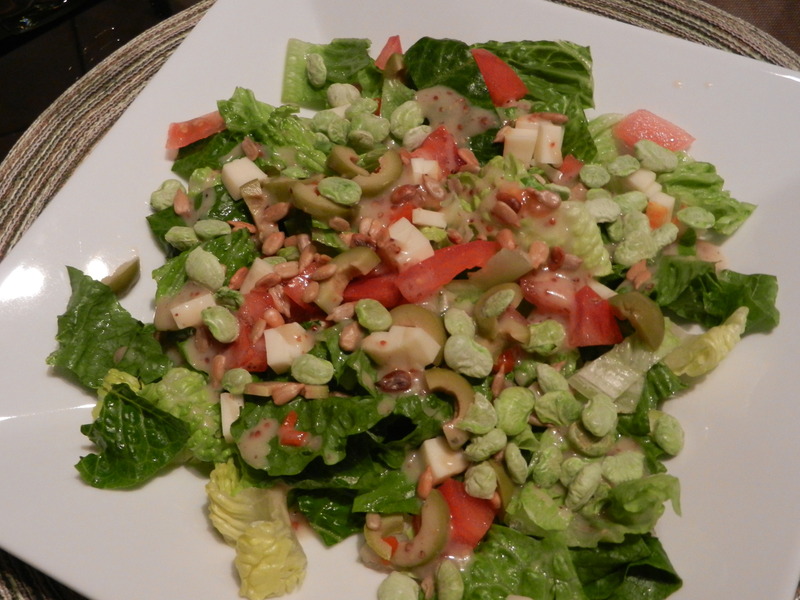 In the mix: romaine lettuce (leftover lettuce still from last Saturday–we usually buy the dark greens for more vitamins and nutrients), tomato, green olives, muenster cheese, sunflower seeds, lima beans, and Newman’s Own Lite Honey Mustard dressing. Very random but pretty tasty. I always enjoy a sweet and salty salad. Olives always add a nice touch of salt. After dinner we watched Modern Family which is definitely my favorite show on television right now, and I I stayed hunkered down on the couch until bed time. I declared yesterday a rest day from working out. If only I could have actually “slept” on “rest” day. Oh well, I’ll get after it tonight. It is rainy here in Minnesota today and only 40° F as I write this morning. Yikes! That’s the kind of weather that makes you want to stay in and bake cookies. Anyone agree with that? Have a fabulous day my friends. Let’s focus on the positives today! Question of the Day: If you could stay home and inside on a rainy cold day, what would YOU want to do?